Almond crescent cookies with sprinkles – perfect Holiday cookies! The truth is almond crescent cookies are so good as they already are, they don’t even need any sprinkles. But they surely look pretty and bright, and colorful and very merry with sprinkles, don’t they? And so let this sprinkle-studded cookie be forever recorded on my blog as a testament to my temporary obsession with sprinkles. This one takes the prize in the sprinkle and color department! But I am a little worried. Are these almond crescent cookies colorful enough for you? Or, do I need to add just a bit more sprinkles? Just let me know. 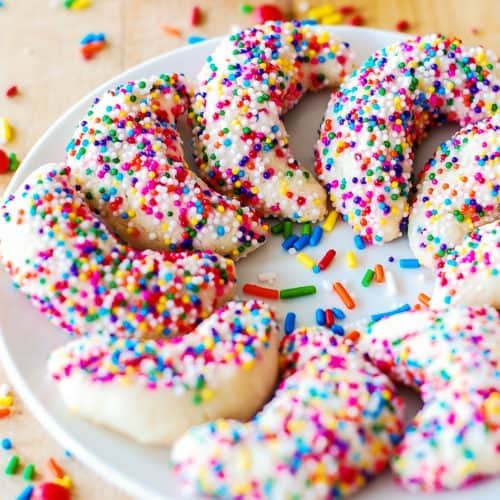 Almond Crescent Cookies - festive holiday cookies decorated with sprinkles. Great Christmas recipe. Add lightly toasted almonds and sugar into food processor and process until almonds are finely ground. Cut cold butter into small pieces and add it to the food processor. Process until the mixture resembles coarse meal. Add flour and salt to food processor, process until dough forms, scraping the sides of the food processor bowl with spatula if necessary. And by the way, 1/2 cup white sugar is more than enough for 1 and 2/3 cups of flour because you will be rolling each cookie in sprinkles! Shape dough as a disk, wrap it in a plastic wrap, put in the freezer for 30 minutes, then in the refrigerator for 30 minutes. Or refrigerate it for at least 2 hours. Divide dough into 4 portions and work with each portion separately, keeping the rest of the dough in the refrigerator to keep it cold. Pinch a portion of the dough and roll it between the palms of your hands in a small ball, then into a small cylinder. When you roll each ball, the cold dough will become more malleable. While the cookie is still in a cylinder shape, roll it generously in sprinkles on a plate. Then, form each sprinkled cylinder into crescent shape with pointed ends. Place each crescent on an ungreased parchment-paper lined cookie sheet and keep the cookie sheet with crescent shaped cookies in the refrigerator until all cookies are shaped. Also keep the dough in the refrigerator when not using it. It is important to keep cookie dough cold before baking to achieve the right cookie consistency. The cookies will require 2 cookie sheets. Bake for about 12-15 minutes until cookies are set but not brown. My husbands favorite! He’s not into a lot of sugar but I think the sprinkles would be ok. I know the grandkids will gobble them up. I’d use Christmas colors (red, white & green) patriotic for 4th of July (red, white & blue) valentine cookies (red and pink) St. Pat’s (green and white) just to keep with a theme. Variety of colors would be great for any celebration. I love these cookies – they are so good! What a great idea to make patriotic and valentine cookies out of these! I’ll take any excuse to eat these all year long! These are so cute! 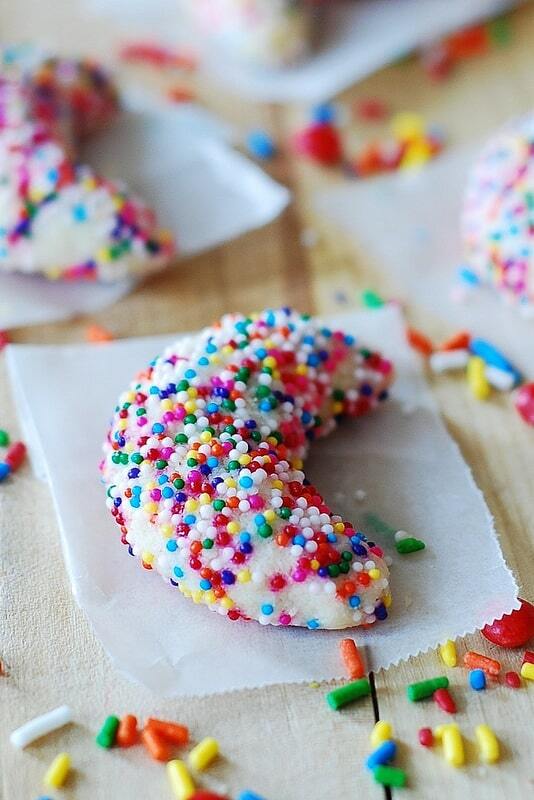 I love all of your sprinkle cookie recipes! 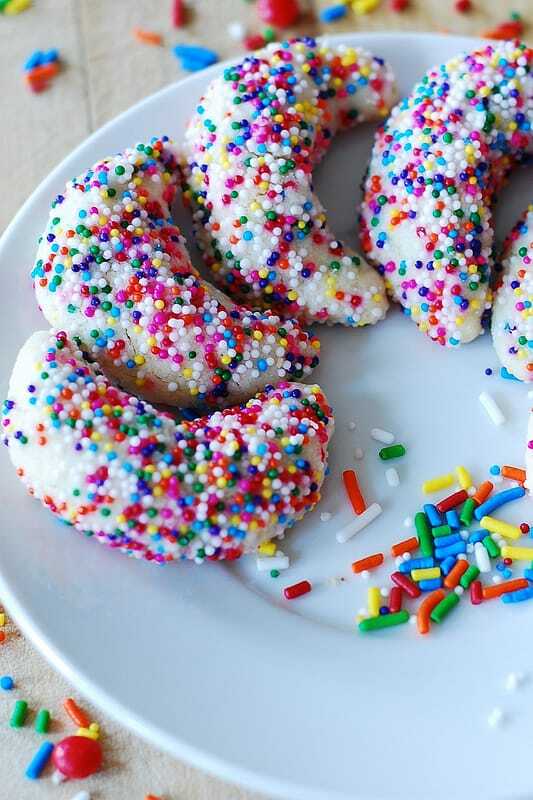 Go ahead and sprinkle away – I have seen almond cookies with powdered sugar but never with sprinkles – brilliant! I just love this total explosion of sprinkles!!! These are awesome, Julia!!! I’m enjoying your irresistible holiday cookie frenzy! I can imagine the wonderful smiles as the scrumptious cookies are devoured! PS: There are never too many sprinkles! Fun, beautiful crescent cookies, Julia! Wishing you a very Merry Christmas!!!! So colourful and festive, Julia. 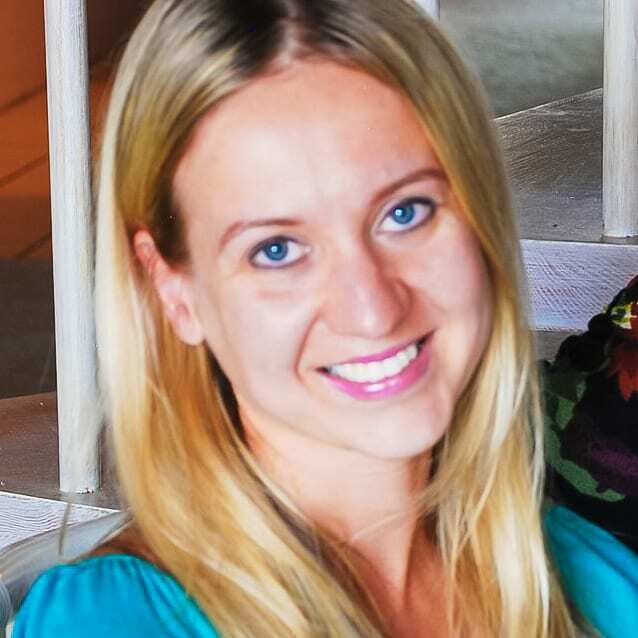 Just beautiful, Julia! 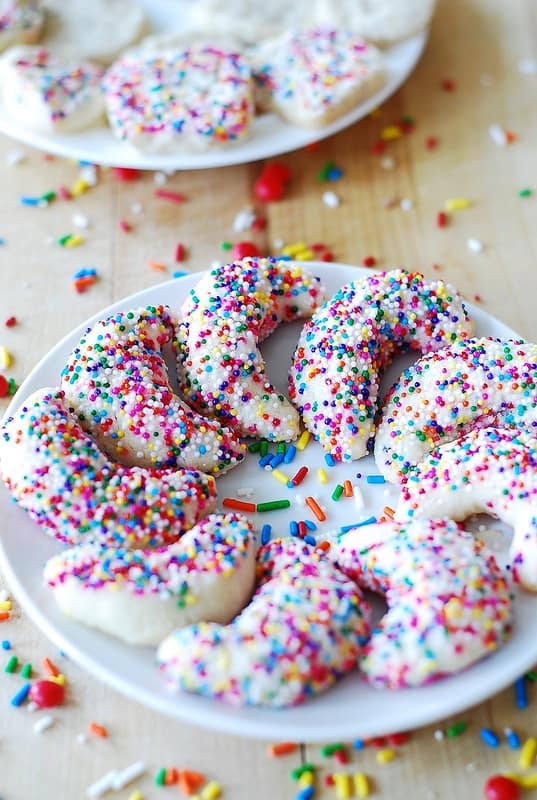 I just adore Almond Crescents and this is the way to deck them out all festive for Christmas with loads of sprinkles! Thanks for sharing, my friend! Pinning!